These 4 powerful Dreadnoughts (sometimes even termed “super-dreadnoughts”), King George V (KGV), Centurion, Audacious and Ajax, were derived from the Orion. But they also incorporated the lessons learned from the trials of the battlecruisers Lion and Princess Royal. 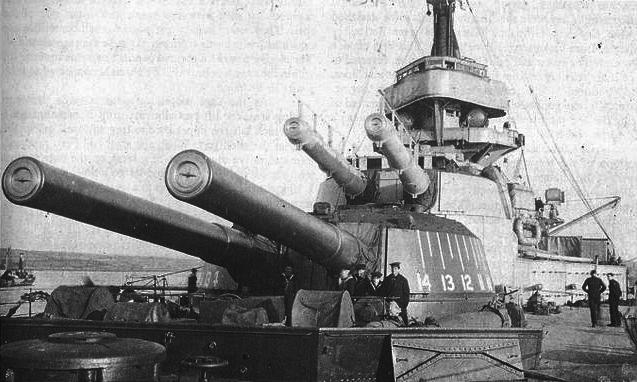 The design remained classic, with five axial turrets and well-cleared superstructures, tall narrow funnels, a smoke-free firing post, and light secondary artillery (4in/102 mm pieces). Their main innovation was the new ammunition developed for the 343 mm cannons, shells with heavier additional charges which increased their range, but also improved fire-control arrangements and additional armour. Three 2nd squadron battleships saluting the Kaiser at Kiel’s naval review, for the opening of the canal, 24 june 1914. These ships featured an impressive -unrivalled still at that time- broadside of ten 45-calibre breech-loading (BL) 13.5-inch Mark V gun. They were housed in five hydraulically powered centreline, twin-gun turrets. Each a +20° elevation, equivalent of a 23,830 yards (21,790 m) range. The gunsights were more limited (+15°) but super-elevating prisms were installed in 1916. The loading system was competely overhauled for the new massive 1,400-pound (635 kg) projectiles. They left the barrel at about 2,500 ft/s (760 m/s). Rate of fire was two rounds per minute on average. A hundred shells was provided per gun. The sixteen secondary 50-calibre BL four-inch (102 mm) Mark VII guns were re-arranged ahead as it was shown TBs tended to attack on the frontal arc. Eight were placed in the forward superstructure, four aft, four in casemates. The hull casemates were blanketed in heavy seas and were deleted and welded shut during the conflict. These guns could elevate at +15° for 11,400 yards (10,424 m) range, firing a 31-pound (14.1 kg) shell at 2,821 ft/s (860 m/s). The teriary artillery consited in just four 3-pounder (1.9 in (47 mm)) saluting guns. Also for vlose-quarters, three 21-inch submerged torpedo tubes were in the sides and stern, with 14 torpedoes in storage. 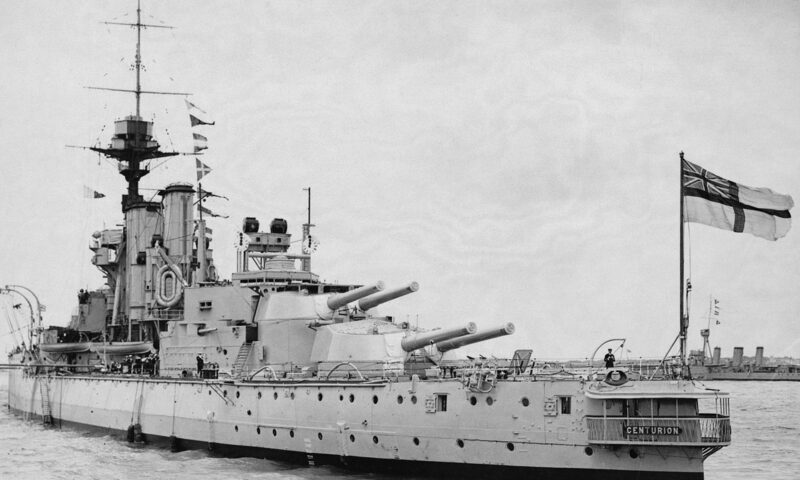 Curcially however, these ships were the first in the Royal Navy to feature the first modern fire control system that will be adopted for all subsequent British Dreadnoughts. It was located in the conning tower. Data came from a 9-foot (2.7 m) coincidence rangefinder, an unstabilized Barr and Stroud. From the next series, stabilized Argo units replaced them. Data transmitted were the target’s speed and course, which were fed into a Dumaresq mechanical computer. The result was transmitted to a Dreyer Fire-control Table (Mark III Dreyer-Elphinstone model). The the transmitting station was located on the main deck, and final transmission went through voicepipe or sound-powered telephone. The fire-control table converted data into usable elevation and deflection for the guns, taking in account dispersion and location of the turrets, although to help spotting the shell splashes, minimising the effects of the roll volley fire was the usual practice. Target data was recorded on a plotting table, allowing the gunnery officer to predict the target’s net moves. If destroyed, turret own systems (the two superfiring ones) could take over. in 1914, QF 3-inch (76 mm) AA guns were fitted to each ship. After May 1916, 81 tons of additional deck armour was added. The KGV was modified to tow Kite balloons for observation. In ealry 1917, a new 4-inch AA gun was installed in replacement for one 3-in gun. Eventually the hull casemates were welded shut and the stern torpedo tube removed while flying-off platforms were fitted on turret roofs. The waterline belt was made of Krupp cemented armour, 12 in (305 mm), and concentrated in the area between the fore and rear barbettes, reduced to 2.5–6 inches (64–152 mm) in the ends, but leaving a gap towards the bow and stern. The upper belt was 16 feet 10.5 inches (5.1 m) above the waterline. This belt also extended just one meter below the waves. Oblique bulkheads 9-inch (229 mm) thick connected thebelts to the ‘A’ and ‘Y’ barbette, which face was protected by 9-10 in. The main turrets were 11-inch (279 mm) on the frontal arc, 3-4-in on the roofs. There were four armoured decks protecting various internal areas, from 1 to 4 in (25 to 102 mm). The thickes was outside the central armoured citadel. The conning tower was 11-in thick, and its roof just 3 in. The gunnery control tower was 4-in thick and the torpedo-control tower 6-in. The anti-torpedo bulkheads covered the engine rooms and magazines with 1-1.75 inches (25 to 44 mm) armoured plates. The boiler rooms also received an additional 1–1.5-inch (25–38 mm) armour plating. These 25,420 long tons (25,830 t) battlships, 89 ft 1 in (27.2 m) wide, were given four shafts and tow steam turbine sets fed by 18 water-tube boilers, for a total of 27,000 shp (20,000 kW), and a top speed of 21 knots (39 km/h; 24 mph). Range was 6,310 nmi (11,690 km; 7,260 mi) at 10 knots (19 km/h; 12 mph). These dreadnoughts were started at Portsmouth, Devonport, Cammell Laird and Scotts in January-February 1911, launched in October-Nov. 1911 and March-September 1912, and accepted in service in Nov.1912 (KGV) and March (Ajax), May (Centurion) and November 1913 (Audacious). Paradoxically, this latecomer was sunk early in the war (October 27, 1914, after 11 months), and was the only loss of the class. In 1917, the masts were modified as tripods, while projectors were protected in armored towers. The bridge was enlarged and the hull’s nets removed. HMS King Georges V was posted to the 2nd squadron and received the title of Home Fleet flagship for a time. She was also 2nd squadron flasghip by all time. On 17-20 July 1914, she took part in a test mobilisation and fleet review following the the ealry July Crisis. She sailed to Scapa Flow waiting for a possible attack by the Imperial German Navy in the North sea. After 4 August, the Home Fleet became the Grand Fleet, headed by Admiral Jellicoe. After the KGV waited, training in the North Sea with rare sorties to try to catch German ships. King George V developed however problems with her condensers in November 1915. and stayed out of operations for monthes. She was deployed twice in a major action. The first was in the wake of the raid on Scarborough, Hartlepool and Whitby, intercepted and decoded by radio, the ships departing on 15 December, on the British sidewith in intent to ambush Hipper’s fleet on their way home. The six dreadnoughts of the 2nd Battle Squadron sailed, including the three King George Vs, and the four Battlecruisers of David Beatty. However if the screening forces met each other in the early morning darkness, in heavy weather on 16 December the Germans won the engagement. However Admiral Von Ingenohl ordered the fleet to turn away, and followed by miscommunications and bad decisions, Beatty left Hipper’s ships to pass through unmolested. The second engagement was at Jutland: The 2nd Battle Squadron sailed from from Cromarty, Scotland on the morning of 31 May, and met the rest of Jellicoe’s fleet, taking part in the left (east) side of the armada. But because of the heavy seas, mist, and light cruisers obstruction, none of the King George V class were able to fire more than 19 rounds in this legendary battle. On 18 August 1916 the High Seas Fleet advanced into the southern North Sea. But yet again, bad communications and mistakes prevented Jellicoe from catching the German ships, and they made it to port while Two British light cruisers were sunk by U-boats. The Admiralty, aware that U-boats and mines infested the sector near the German coast passed some point forbade the Grand Fleet to make ny sortie. The last time the King Georges V sailed off to sea was on 23 April 1918 after catching a radio transmission from the Hochseeflotte, at sea to try to catch a convoy, but the were too far away and escaped. The King Georges V was present when the German fleet surrendered on 21 November. After the war, she survived until 1926 as a training ship, then was disarmed and broken up in accordance of the Washington Treaty. The HMS Ajax, built at Scotts Shipbuilding and Engineering Company, Greenock joind to the 2nd Squadron and fought in Jutland and made the same sorties as other 2nd squadron battleships (see above). She also made a sweep 17–19 May and 29–31 May in the north sea. At Jutland a year later, Ajax (Captain George Baird) was the second ship from the battle line head, firing one salvo of six ronds to the German battlecruisers shortly after 19:00 but stopped when the 4th Light Cruiser Squadron passed in between. Her last missed occasion was when in April 1918, the hochseefloote, respeting a total radio solince sortied to attack British convoys to Norway. However Molkte was damaged and broke the silence. Her call was catch by Room 40 which crambled the fleet, of which Ajax was part. None reached the scene in time. 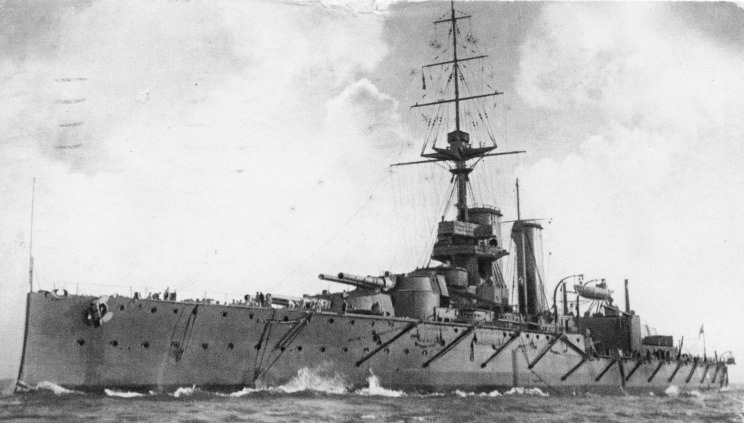 At the end of 1918, HMS Ajax entered the Mediterranean (4th Battle Squadron) and joined the British Black Sea Fleet, which supported the coalition troops against the Bolsheviks and covering the evacuation of Odessa. She was present in the Chanak Crisis near Smyrna, and remained in Gibraltar until 1924 and was sold shortly thereafter, paid off in 1926. HMS Centurion: A fake battleship in 1944. When making her sea trials on the night of 9/10 December, HMS Centurion accidentally rammed and sank the Italian steamer SS Derna, a cargo ship. She was under repair until March 1913 an later joined the 2nd Squadron for the remainder of the war with her sisters, commanded by Vice-Admiral Sir George Warrender. 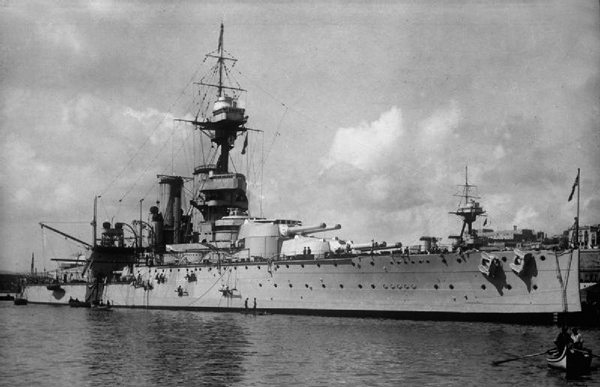 King George V was the squadron flagship. HMS Centurion received on board the President of France, Raymond Poincaré, for the naval review at Spithead on 24 June 1913 while her sisters represented the Royal Navy at the Kaiser Wilhelm second opening of the Canal in Kiel, Germany, in June 1914, and Kiel Week. The HMS Centurion in 1919 joined HMS Ajax in the Black Sea, then joined Portsmouth after 1924 to be converted into a target ship. She did serve as such until 1941, escaping the Washington treaty clauses as whe was disarmed and disarmoured, still in Portsmouth. She then went into a shipyard to be modified and serve as a massive decoy ship, equipped with reformed sheet plates and welded wood, camouflaged to resemble the modern battleship HMS Anson in 1942.
later served in Egypt as a floating AA battery until January 1944, sent back to Britain, before ending as a makeshift jetty in Normandy for the artificial Mullberry on June 9, 1944. The HMS Audacious was part also of the 2nd squadron. While the latter was conducting gunnery training off the northern coast of Ireland on 27 October, she struck a mine in the Lough Swilly field. Although her watertight bulkheads worked wonders, the water continued to slowly seep in, and the weathering prevented towing maneuvers. however all of her crew was successfully rescued before she capsized, on October 27, 1914. Armament 10 x 343 (5×2), 16 x 102, 4 x 47, 3 x 533 mm TTs (SM lat and rear). Armor (max figures) Belt 300, Battery 250, Barbell 280, turrets 280, blockhouse 280mm, decks 100 mm. Friedman, Norman (2011). Naval Weapons of World War One. Barnsley, UK: Seaforth. Brown, David K. (2006). Nelson to Vanguard: Warship Design and Development 1923-1945. London: Chatham Publishing. Halpern, Paul G. (1995). A Naval History of World War I. Annapolis, Maryland: Naval Institute Press. Parkes, Oscar (1990). British Battleships (reprint of the 1957 ed.). Annapolis, Maryland: Naval Institute Press.